Steven Haworth “Steve” Miller was born on the 5th October 1943, in Milwaukee, Wisconsin USA. He is a musician, singer, songwriter, and guitarist, who is probably best known for being a founding member of his own band called the Steve Miller Band, a rock group. With the band he has released over 30 albums and 30 singles, including “Number 5” (1970), “Circle Of Love” (1981), and “Let Your Hair Down” (2011). His career has been active since 1966. Have you ever wondered how rich Steve Miller is, as of mid-2016? According to sources, it is estimated that the total size of Steve’s net worth is over $40 million, which has been accumulated through his successful career on the music scene as a singer, songwriter, and guitarist. 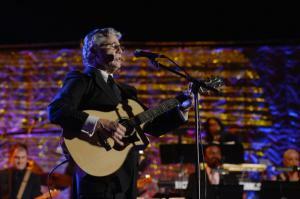 Steve Miller is the son of Berta, who was a singer, and George Miller, a physician. During the 1950s, he moved with his family to Texas, where he attended Dallas’ St. Mark’s School, where he formed his first band called The Marksmen. Soon after, he transferred to Woodrow Wilson High School, from which he matriculated in 1961. In the following year, he moved back to his hometown, where he enrolled at the University of Wisconsin–Madison, but Steve decided to quit education and began pursuing a professional career in the music world. Steve`s professional career began in the early 1960s while he was still in college. He formed the band The Ardells, with Boz Scaggs, Micheal Krusing, Denny Berg, and Ben Sidran. However, the band didn`t last long, as Steve wasn`t satisfied with their music scene, and left the band, returning in 1966 with a new formation and new band called Steve Miller`s Blues Band, which later became known as The Steve Miller Band. Ever since then his career has gone only upwards, and so has his net worth. The band`s first album came out in 1968, entitled “Children Of The Future”, but reached only No. 134 on the US Billboard 200 chart. Nevertheless, Steve released another album the same year, entitled “Sailor”, which reached No. 24 on the US Billboard 200 chart, and achieved gold status. However, until 1973 and the release of their eighth studio album “The Joker”, which reached No. 2 on the Billboard 200, and achieved platinum status, Steve didn`t have any major commercial success. This album increased his net worth considerably, and encouraged him to continue in the same way. During the 1970s, he and his band experienced high popularity, and with albums “Fly Like an Eagle” (1976), which achieved four times platinum status, and “Book of Dreams” (1977), which achieved triple platinum status, Steve`s net worth increased to a large degree. He continued successfully in the early 1980s with albums “Circle Of Love” (1981), which was eventually certified gold, and “Abracadabra” (1982), which reached No. 3 on the Billboard 200 chart, and achieved platinum status in US. After that, his popularity began to decline, and since “Abracadabra”, he hasn`t had any major commercial success. He has released six more albums, the last one being “Let Your Hair Down” in 2011, which only reached No. 189 on the US Billboard chart. Thanks to his talents, Steve has received several prestigious awards, and accolades, including induction into the Rock ‘n’ Roll Hall Of Fame in 2016, and as a part of the band, Miller received a star on the Hollywood Walk of Fame. Speaking about his personal life, Steve Miller has married four times. He is in marriage with Janice Ginsburg Miller, with whom he resides in New York City. 2 The Steve Miller Band was awarded a Star on the Hollywood Walk of Fame for Recording at 1750 Vine Street in Hollywood, California. 3 he would come to Oklahoma every year until someone threw an empty whiskey bottle at him on stage, he never came back until Oklahoma petitioned him to come back in August of 2005. 4 Les Paul taught Steve Miller how to play the guitar at the age of 5. 5 Lead singer of rock band Steve Miller Blues Band. Der Mann auf der Brücke 2009 TV Movie writer: "The joker"
Guitar Hero World Tour 2008 Video Game writer: "The Joker"
Lost Islands 2008 writer: "Abracadabra"
The Love Guru 2008 writer: "The Joker"
My Super Ex-Girlfriend 2006 writer: "The Joker"
Babel 2006/I writer: "The Joker ATFC's Aces High Remix"
L'anniversaire 2005 lyrics: "Abracadabra" / music: "Abracadabra"
William Eggleston in the Real World 2005 Documentary writer: "Living in the USA"
El Lobo 2004 writer: "The Joker"
Little Black Book 2004 writer: "Angel"
Karaoke Revolution Volume 2 2004 Video Game writer: "The Joker"
Earthly Possessions 1999 TV Movie writer: "I Love You"
Space Jam 1996 writer: "Fly Like An Eagle"
Sabrina, the Teenage Witch 1996 TV Series writer: "Abracadabra"
Sgt. Bilko 1996 writer: "Living In The USA"
Lassie 1994 writer: "Going to the country"
My Girl 2 1994 writer: "Swingtown"
Dazed and Confused 1993 performer: "Living In The USA" / writer: "Living In The USA"
Otto - Der Liebesfilm 1992 writer: "The Joker"
The Big Chill 1983 writer: "Quicksilver Girl"
FM 1978 performer: "Fly Like An Eagle" / writer: "Fly Like An Eagle"
Pacific Vibrations 1970 Documentary writer: "Motherless Children"
Homer 1970 writer: "Brave New World"
Captain Milkshake 1970 writer: "Children of the Future"
All Things Must Pass: The Rise and Fall of Tower Records 2015 Documentary writer: "Living in the USA"
Blended 2014 writer: "True Fine Love"
Need for Speed 2014 writer: "Fly Like An Eagle"
Anchorman 2: The Legend Continues 2013 writer: "Jet Airliner"
Grand Theft Auto V 2013 Video Game writer: "Rock'n Me"
The Incredible Burt Wonderstone 2013 writer: "Abracadabra"
Dark Shadows 2012 writer: "The Joker"
Ja el tenim! El disc de La Marató 2010 TV Movie documentary writer: "Prop dels estels"
Kottan ermittelt: Rien ne va plus 2010 writer: "The Joker"
L'arnacoeur 2010 writer: "The Joker"